More than a dozen news reports, analyses, and dozens of photographs documenting the intense struggles of the teachers, students, parents, and community members to keep Chicago’s Senn High School as a general high school are available on the various Substance Web sites that Substance hopes to consolidate and update during the coming months. 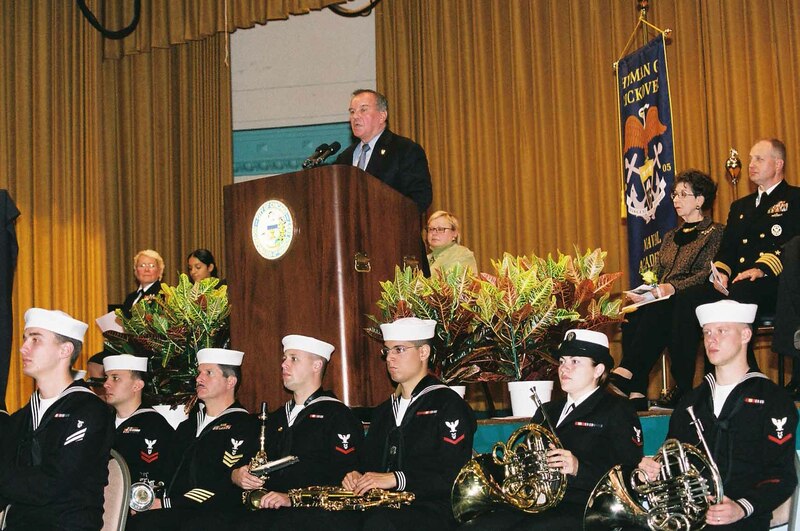 Above: On November 5, 2005, behind three layers of security (military; Chicago police; Chicago Public Schools) Chicago Mayor Richard M. Daley (above at podium) dedicated the "Hyman Rickover Naval Academy" inside Chicago's Senn High School. The event featured music by the Navy Band from Great Lakes Naval Training Center, north of Chicago, and thanks from the widow of Admiral Rickover (seated beneath the Rickover banner second from right on the stage above). Below Daley's elbow (above on stage, third from right) is Chicago Alderman Mary Ann Smith, who has been trying to eliminate the general high school program at Senn High School — with Daley's support — since 2004. Substance photo by George N. Schmidt. Substance’s exclusive coverage of the Senn struggles continued, month after month, over the next four years. In September 2008, Senn will celebrate its fourth year of struggle against the militarization of the school and the concurrent attempt by Chicago politicians to destroy Senn as a general high school and, most recently, to convert it into four “small schools”. Out of all the huge-empty-spaces in the Chicagoland area, why disrupt the history of this beautiful, successful but; not without challanges High School. And why would a peaceful neighborhood want a gang of navy boys hanging out, God-Bless-Um!This would be a a total mistake. Why not use the Uptown & Riveria Theatre's, redo those historic structures, near the Lake, sitting empty, also not far from the Navy Pier. Leave this wonderful H.S alone. Please? Joyce Stenger, I do mourn with you. But crying about it is not the answer. All these school closings are unnecessary. CTU did the math; CPS actualy has a surplus of money. Their deficit claim is a lie built to justify their greed for money. In order to get more money for themselves by closing schools. We need to stand united students parents and teachers. Your school will be missed we are all sorry, but you can stop future schools from being closed. They think we are stupid. And mabye we are for not getting informed sooner. But we can stop the Board of Education. Ctu has been protecting the rights of students for years. showing our support for Ctu and getting involved are probobly some of the best ways to help. P.s. Notice how most school closings are in the south side of chicago? Info from Ctu.net look for the black and white report.